The site of the proposed apartment block development. PLANS for a three-storey apartment block in Girrawheen opposed by residents have been knocked back. The North-West Development Assessment Panel rejected owner Lam Property Development Group’s proposal for a 42-unit building on Strive Loop at its March 20 meeting. 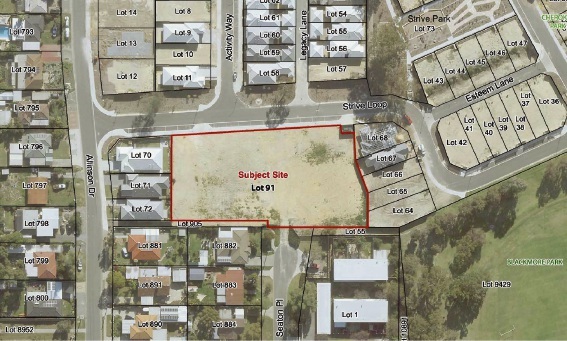 The City of Wanneroo had recommended approval but this was not supported by any of the panel’s five members, who instead voted to refuse it for seven reasons. These included a lack of on-site visitor car parking bays, inadequate amount and location of communal open space, loss of amenity to neighbouring properties on Allinson Drive, unreasonable level of impact on surrounding landowners and lack of agreement from adjoining owners. Resident Eileen Pool presented in opposition to the development, citing fellow residents’ concerns as perceived excessive height of the building, excess traffic, lack of on-site parking and it being “out of character” with the area. She said a petition opposing it had garnered signatures from more than 100 residents. Girrawheen MLA Margaret Quirk also spoke against the development, calling it “not appropriate” for the suburb. She believed residents did support development of the land but to a smaller scale. “Because it’s allowed doesn’t mean it’s the right kind of development,” she said. City planning officer Jay Naidoo said the application complied with building height and traffic requirements and that such a development was always planned for the site. “I empathise with the residents but this is what was envisaged for the area,” he said. The City received 46 submissions objecting to the apartments during public consultation, with several raising concerns about anti-social behaviour and worried they would be rented out. Robert Forgione from applicant Concept Building Design said only about 5 per cent of buyers would be investors. The City’s report said the proposal generally met requirements, except in relation to boundary walls, dwelling size, communal open space and deep soil areas but that the variations were minor.